Ms Lee, 45, an avid jogger, had been jogging almost every day for the past five years. Recently, her knees started to hurt. Gradually, walking up and down the stairs became a problem too, so much so that she had to stop her exercise routine. She went to her general practitioner and was given anti-inflammatory painkillers. That helped a little but it was still painful getting up from the chair or going down the stairs. She was also given a glucosamine and chondroitin supplement and tried knee braces and infrared lamps, with little success. After three months and little improvement, she had a specialist examination and X-ray investigation of both knees. The diagnosis was osteoarthritis of both knees - a chronic disorder in which the cartilage lining of the joint gradually breaks down, forming cracks and holes, and eventually, exposing the underlying bone. Physiotherapy was prescribed for knee strengthening exercises. However, progress was slow and the knee pain was interfering with the activities of daily living. She felt a great deal of pain and found it difficult to walk down the stairs, get out of a car, get from a sitting to standing position, and even when she was lying in bed with knees straightened. Finally, she was told she needed knee replacement surgery. Reluctant to go ahead with surgery, she wanted to know her chances of recovery without it and whether she could jog again. Generally, it is quite common for joggers to suffer from knee pain. They are likely to suffer from knee injuries such as menisceal tears and anterior cruciate ligament strain, as well as osteoarthritis of the knee. 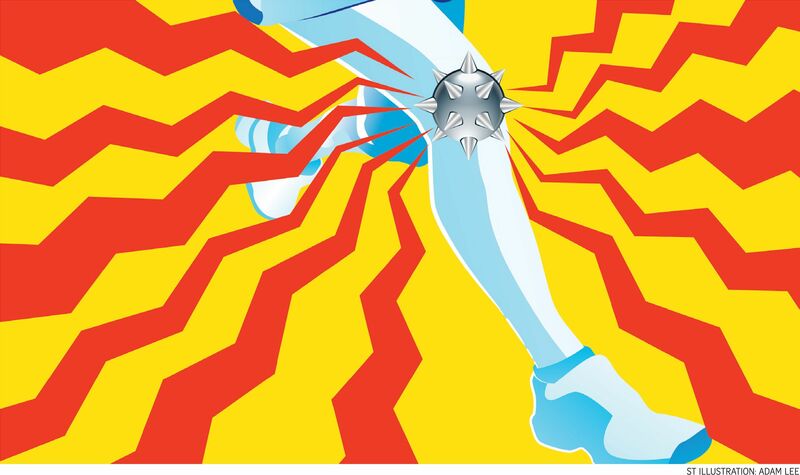 For jogging to cause wear and tear of the knee cartilage, resulting in osteoarthritis, takes many years of abuse and extreme conditions. The most common cause of knee pain in a young, avid jogger would be menisceal injuries. The meniscus is a cup that holds the two moving knee parts in the knee joint together. It gives stability so that the movement of the knee does not result in it giving way. Depending on the severity of the menisceal injury, different types of treatment - ranging from rest and rehabilitation to injections of anti-inflammatory medication and surgery - would be recommended. Those with severe menisceal injury may need a total knee replacement. Cartilage loss and subsequent arthritis of the knee also cause knee pain. Generally, serious, competitive joggers tend to wear out their knee joints earlier. A 30-year-old jogger may have the knees of a 60-year-old non-jogger. This usually occurs over many years. The increased loss of cartilage can result in severe late-stage arthritis that would require a total knee replacement. Treatment with the injection of an artificial gel or visco-supplement into the affected knee, to lubricate and reduce arthritic inflammation, can give up to five years of pain relief. It can also potentially give complete pain relief, especially when combined with knee-strengthening exercises. Supplements such as glucosamine may have a role in reversing early to moderate knee arthritis. Studies show that about 35 per cent of patients taking a regular dose of 1,500mg glucosamine sulphate daily can increase cartilage regeneration. However, 60 per cent of the general population may not have any response to glucosamine. In late-stage arthritis, there is full thickness loss of cartilage, ulceration of bone and cyst formation in the opposing bone surfaces, together with deformity of the knee joint. It makes walking difficult due to pain, instability and stiffness of the affected knee joints. Once a person is diagnosed with moderately severe or late-stage arthritis or loss of cartilage of the knee joint, it would be best to stop jogging or standing for prolonged periods of time (over an hour). But the knee joints still need movement regularly to circulate the knee fluid within, otherwise another set of problems could complicate the condition. Hence, swimming would be the best exercise option. Walking in water or hydrotherapy (aqua aerobics) and cycling are also good alternatives. Ms Lee, who had moderately severe arthritis and a medial menisceal tear, opted to inject artificial gel and platelet-rich plasma into the meniscus tear in her knee joint. It was an outpatient, bedside procedure, done under local anaesthesia. Her pain improved dramatically within minutes of the injection. There was no downtime and she was able to get up and go home. Three days later, she was able to do some brisk walking as well as swimming. She was also able to sleep better without needing a pillow support for her knee. However, she was advised to stop competitive jogging and running. She was told it was best for her do low-impact sports in future and that she should avoid jumps and squats. Remember that once there is knee cartilage loss and degeneration, it may be irreversible beyond moderate and late-stage arthritis. We can stop the inflammation and pain but the process of degeneration and wear-and-tear may continue. Then an artificial replacement of the knee joint may eventually be needed. •Dr Bernard Lee is consultant pain specialist and director of Singapore Pain Care Centre at Paragon.